Shakespeare’s tragedies are fertile ground for mythmaking in Brazil. One of the main policies is superimposing local issues upon the Shakespearean matrix to contest hegemonic discourses and expose political scandals. José Celso’s Ham-let (1993) at the Teatro Oficina is an anarchic, tragicomic, Dionysian appropriation of Shakespeare’s play that articulates the director’s non-conformism with Brazilian social and political realities. Caixa-Preta’s Syncretic Hamlet (2005), directed by Jessé Oliveira, is a cultural translation enacted by a group of Black actors, highlighting the significance of negritude. This chapter discusses both productions, available on the MIT Global Shakespeares Video & Performance Archive, in the light of theoretical concepts by Oswald de Andrade and Silviano Santiago. Although the Brazilian Hamlet versions take liberties with Shakespeare’s text, paradoxically, they also show the deepest respect for it. Syncretic Hamlet. 2005. MIT Global Shakespeares. Video and Performance Archive—Open Acess. 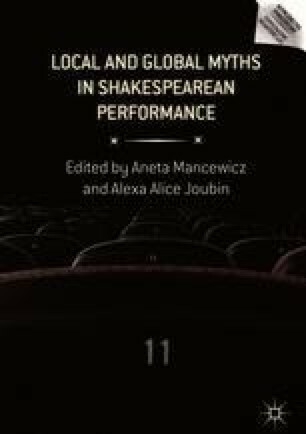 Available at: http://globalshakespeares.mit.edu/brazil/#.